Life is a continuing cycle of newness, then growth, and then gone: then birth and growth again. 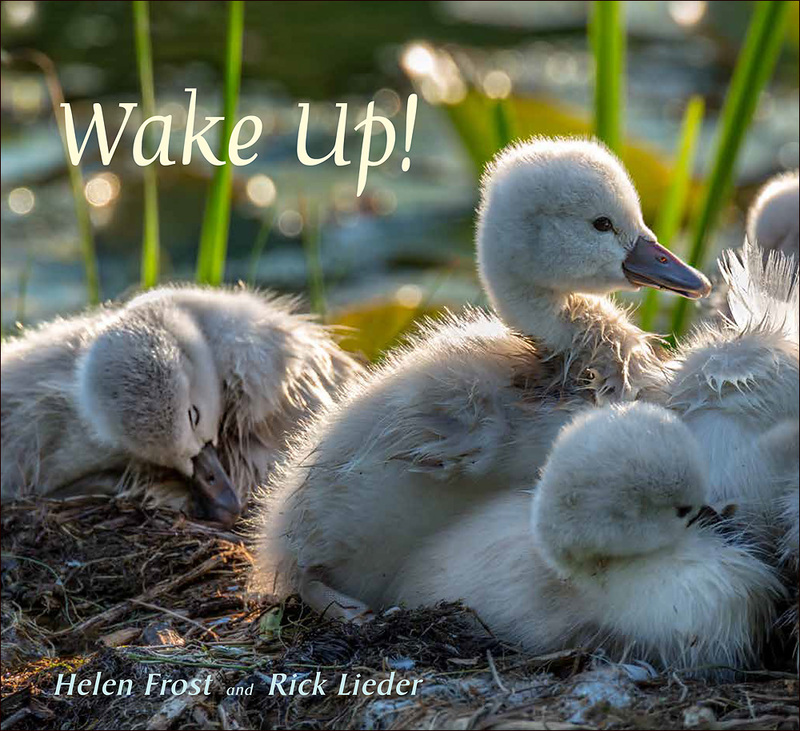 I started thinking about that theme of new life and new beginnings several years ago, and WAKE UP!, published by Candlewick Press, is the result. Working with my collaborator, poet Helen Frost, our book is about opening eyes—our own, first—and pointing to the world that’s right here, containing us all. Helen and I are both based in the US Midwest, so we started there, with a world that we didn’t need to travel far to explore, only wake up enough to actually see. Lifting up a random garden brick to find these tiny, translucent eggs in the mud—they’re almost glowing. Slug eggs! Who knew they were so beautiful? After weeks of waiting for a swan’s eggs to hatch, I caught a glimpse of the last of seven cygnets, breaking through its egg, barely able to keep its head upright, wet feathers just starting to dry. During a garden party, I noticed a pair of wrens building a backyard nest. I had to duck out of the party, but I got this amazing image of the proud mother with a feather to pad her nest; we ended up using it for the book’s back cover. A serendipitous capture: a tiny adult vinegar fly lands on the head of a days-old sawfly larva, fifty times its size. And neither one seems to mind. As happens with all my books, I had more images than would fit in 32 pages. For the first time, last spring I watched a robin family go from newly-laid eggs to the first baby to leave the nest, and I was able to include a video sequence of the mother robin feeding worms to her nestlings in the trailer I made for WAKE UP! Any of these photos, all of them, are just one turn of the daily kaleidoscope of life, that big group portrait of the wild and subtle panoply existing everywhere around us. Especially now, in this unsettled and rancorous climate, renewal seems especially necessary, and feels especially good.